Castella or Kasutera Cake has been a quite popular cake in Asia for a long while. I guess when I first have this cake I have no idea what is so special about this cake. It seem to be a spongy cake with hint of honey. The top always seem sticky and brownish. The cake texture is soft and even if leave outside it still remain it softness. 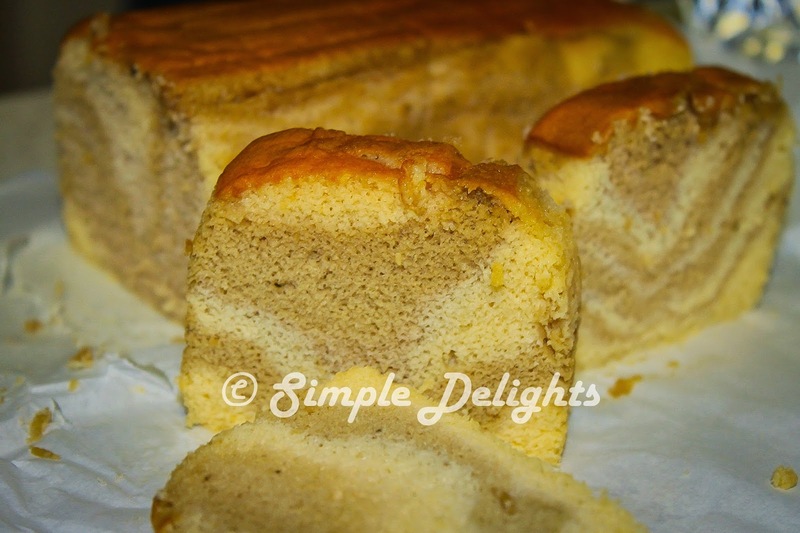 After much research , I knew this cake required to bake in a wooden mold and the cake is baking sponge cake in low heat and not over beat the cake . Not suppose to crack, should raise evenly . The bigger mistakes one can make is incorporate too much of air while beating the eggs and mixing with the flour. The flour need to be bread flour which is high gluten. So required to beat the egg on a bath of warm water this will help make the texture of the cake fluffy . I come across this recipe by ->Kitchen Tigress. To me this is more like a chiffon cake method with egg white beat separately and mix the egg yolk in slowly. I like her details and the you tube link to help understand how to make this cake. Which does make me feel more confident of it. 2. Beat (with hand held electric mixer in low speed ) egg whites till bubbles started to form and gradually add in castor sugar and continue beating. 5.Add honey and repeat the whisking. 6. Sift half of the bread flour into the batter, mix with whisk till almost even. Sift in the remaining flour . Mix till just even. 7. Drizzle the milk in the mixture , whisk skimming just top part of the batter , till no milk is seen. 8. Scrape down and fold the mixture with spatula, banging the bowl against worktop from time to time, till everything is well combine. Let batter rest 10sc or so in midway, then bang the bowl against worktop. 9. Pour batter into line cake pan, slowly and from about 30cm high so that the air bubble burst as they flow out of the bowl. As I am doing the Green Tea layer, so what I did was, one scoop of pure honey batter, one scoop of green tea batter. Repeat till all the batter is finished. 10. Tap pan against the workshop 3-4 time . 11. Place the pan in the lower bottom of the oven and bake for 35min. As mention above this cake was baked in a special wooden mould. Is such impossible task to find one in Australia. Even if I manage to get one from Asia , to bring in a WOOD product to Australia, might cost another AUD200- 300 to treat it before you can bring a wood item in this country. I do consider to did what Kitchen Tigress did , using cardboard. However I can not find any cardboard to modify. At the end of the day , I found something in Daiso which is a rectangle paper baking mould. 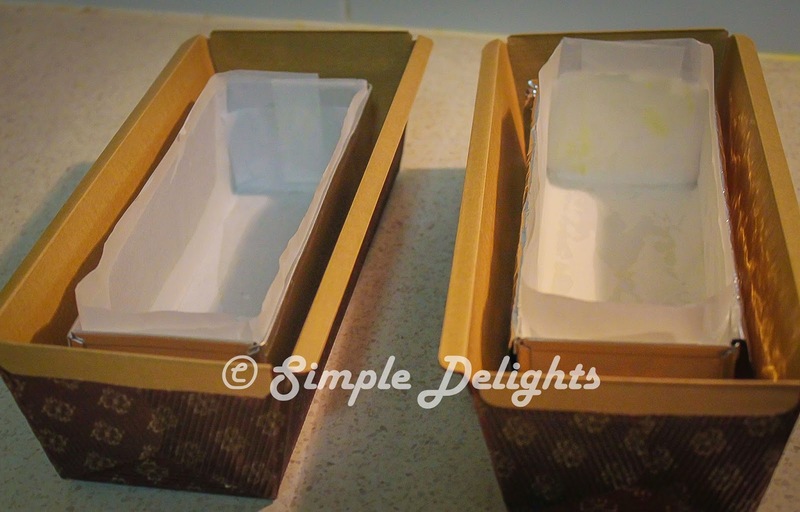 I am going to bake this cake is some rectangle small tin , it just fit in nicely in the paper baking mould. Voila !!! So this is how I bake this cake. Another important note, once remove the pan from the oven. Remove the tin from the paper baking mould. Drop the cake tin from about 30cm high , 2-3times. Wait a few moment when the top of the cake start to wrinkle slightly, invert cake tin onto wooden chopping board. Wait till top of the cake is flat and smooth , about 30sc. Re-invert the cake tin and leave it to cool on wire rack. Unmould, trim edges , cut and serve. I did not eat the cake immediately so I wrap it with baking paper and put in a Ziploc bag and place in the fridge . 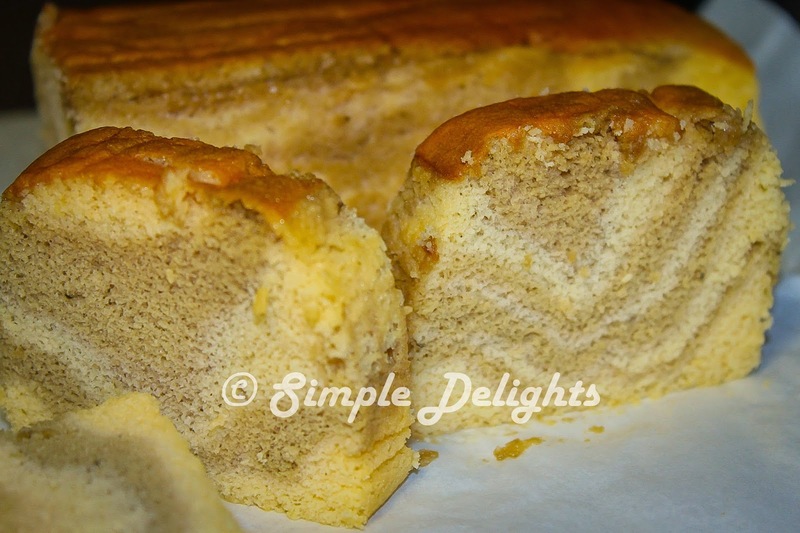 The cake is moist and soft , I might have pour in too much batter, so that is a slight crack in the cake. Is it actually ok to put some to a cupcake paper to bake it as cupcake to enjoy. I will do it next time so not to over fill in the cake tin.